Moxa (also known as mugwort) is a natural herb that possesses a remarkable ability to expel cold and dampness, generate heat, and stimulate the flow of Qi and blood within the body. Heat has been used since ancient times to stop “cold pain” by warming the body. Primitive forms of moxibustion first developed in China, where people burned bundles of branches or hay – using heat to heal the body. Today, the most common style of moxibustion involves lighting a stick of moxa and holding it near the area being treated (indirect moxibustion). Moxibustion is administered in conjunction with acupuncture, and most individuals experience an immediate sensation of warming and relaxation. Moxibustion penetrates deeply beneath the skin. The heat from the moxa herb travels deep into the body in order to stimulate circulation of Qi and blood throughout the body. Moxa is used to treat pain and illness due to Cold and Dampness, such as the common cold & flu, joint and muscle pain, as well as menstrual cramps and infertility. Moxibustion is an effective, complementary therapy for sports injuries. It is often used to treat chronic conditions (which are also often slow to heal), such as lower back pain, muscle stiffness, tendonitis, and arthritis. Moxa is also known for its remarkable ability to turn breech babies. It opens up the uterus, making room for the baby to turn. When combined with acupuncture, moxibustion also increases fetal movement and encourages the baby to shift to the correct position. Chinese Cupping Therapy relaxes muscles tension and removes toxins from the body. Cupping therapy is created by placing small, sanitized glass or plastic jars on the surface of the body to create a vacuum. After the air is removed by air pump or heat, the cups create a powerful suction by stretching the tissue. The vacuum created by suction cups reduces pain and releases tension, increasing energy and blood circulation in the muscles as well as reducing trigger point tension. Cupping marks show where congestion or toxins accumulate or blood or energy stagnation occurs. Cupping removes toxins, relaxes muscles and removes tension. The cupping marks usually disappear and fade in a few days depending on the body type and the strength of the suction. If you are on blood thinners or with bleeding disorder you need to proceed with caution and consult your MD. 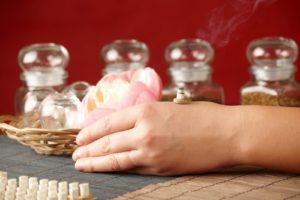 For more information about Acupuncture, Moxibustion and Cupping in Connecticut and if they are right for you, please call us at (860) 502-9462 to schedule an appointment (a FREE consultation is included). Our experienced acupuncturist, Dr. Han, will help you achieve your goal with compassion, care and dedication.